Businesses making the switch to VoIP need to consider choosing Vonage. Besides the major savings that businesses see—an average of 30% on phone bills when compared to landlines—Vonage Business has over 40 calling features built in to its business service and provides users with high-quality, clear voice services and an easy setup. Small to enterprise businesses looking for clear voice quality. Vonage extensions start from as little as £12.00. The actual price you’ll pay for the extensions depends on the number of lines you need for your business. To connect to the service, you can use the company’s range of VoIP-ready phones. Vonage often runs big discounts on set-up fees for new subscribers, offering perks like a free phone for all new business lines. Make and receive calls on multiple devices? Can Vonage Business Solve Your Communication Concerns? One of the biggest VoIP providers in the USA is Vonage, headquartered in New Jersey. Founded in 2001, Vonage has captured an impressive share of the market with millions of homes and businesses using them to access their VoIP service. The company has built an incredible infrastructure to take care of its massive residential user-base. That same stability can be relied upon for its business services. 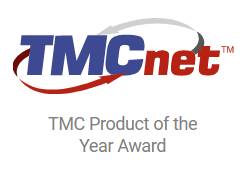 Vonage Business has received countless awards for their quality of service and devotion to helping small businesses, including the 2017 Unified Communications Product of the Year, People’s Choice Stevie Awards for Favorite Customer Service, Internet Telephony Product of the Year and Channel Program Excellence, and Frost & Sullivan’s Top VoIP Communications Award just to name a few. It’s no surprise when you read through the following and discover the kind of features Vonage packs into its business VoIP and business support. With Vonage Business, the standard desktop connection works just like any other VoIP provider, but that’s not the only way you can connect to your Vonage account. For micro-businesses, the company offers Vonage® DesktopConnect, the company’s app for Windows. This is a desktop and laptop program known as a “softphone” that allows you to use VoIP from your PC. You can make calls using the integrated softphone app and also send text messages, check contact history, missed calls, and even listen to voicemail. All you need to make it work is a headset with a microphone (available in both USB and Bluetooth.). Vonage also offers business VoIP phones and other add-ons to customers from brand leaders including Cisco, Polycom, Panasonic and Yealink. If you have existing VoIP ready phones, those can be used or you can purchase and use virtually any corded or cordless VoIP capable phone for use on the Vonage network. Vonage understands that life happens, especially when you’re trying to run a business. And when things don’t go right, it’s not always during normal business hours. You’ll never have to worry about disconnects with Vonage’s 24/7 customer service and tech support. Outside of the toll-free customer service center, there is also a huge self-help section on the company’s website. It’s written in a very friendly, non-technical way and covers all aspects of Vonage’s service. The support portal includes helpful articles, and a searchable knowledgebase to help you tackle any issues that might arise. From the same portal, you can manage your account and alter your service features and settings. Support is a big deal for business hours, and it’s clear that Vonage has you covered with knowledge and business support accessibility. Calls to international numbers are incredibly competitive, and Vonage is supremely confident that no other VoIP provider can beat its rates. There’s no requirement for you to pay a monthly surcharge to access the rates, either. To access it, go through your normal Vonage business login process. Then, simply switch on your “International Long Distance” feature on your account. This gives you access to the heavily discounted landline and mobile phones. For example, at time of writing, the cost of calling Albanian landlines was as little as 8 cents a minute with mobiles at 34 cents. Vonage’s version of the auto attendant service is called the “Virtual Receptionist”. You’ll know this feature best as “press 1 for sales, press 2 for accounts” and so on. You can set up as many virtual receptionists as you like with the service. The experience you give inbound callers is something you can specifically tailor-make to suit the business and help people who want to connect with you. Calls can either be routed to an individual number or distributed as part of a call group (for example, the technical department might be a call group). According to Vonage, this is “not only one of the most popular (features), but it’s also the feature that most businesses set up first”. With it, you can connect customers and suppliers to the most appropriate contact without the need for multiple transfers or accidental dropped calls. After using your Vonage business login, you’ll gain access to your administrative portal that offers a seriously intuitive and easy-to-maintain call management system that is rich with customizable features. For example, call queueing allows you to keep callers on the line when there’s no one available to pick up the phone. You can use the time the callers are waiting to pass on information and promote your special offers. This is a technique that local businesses, like pizza restaurants, often use to promote specials. Depending on your business model, it could be a smart way to improve the average order volume and lifetime value of your customer. if it’s not convenient to take a call, transfer the callers directly to voicemail. You’ll have complete control of your virtual extensions, call groups, and more from a simple interface that you can access from anywhere you have an internet connection. You won’t find the fax feature as a standard item with Vonage for business, but given the ability to handle documents easily through digital means like email, it’s not an issue for most businesses. If you absolutely must have the ability to send and receive a fax, Vonage provides users this option (from both desktop and mobile) for a small monthly fee. Any faxes you receive are delivered straight to your email. Vonage MobileConnect for Essentials is the popular app for subscribers to the service. With the app, your team can make and receive business calls or texts from any device using your Vonage account. The application offers virtually all the same features and functionality as a desk phone, and offers seamless integration with your Vonage business account. Additionally, users can sign up for the Enterprise SMS solution, VideoConnect and CRMConnect, which seamlessly connects with your existing CRM software. Windows users can also integrate with Microsoft Skype for Business, MySphere Assistant toolbar for Internet Explorer and the Unity Receptionist client for handling the front desk. Any calls made by your mobile device will list the caller ID for that user, or your company, which reinforces your brand identity and professionalism. Your contacts will never know that you’re working outside of the office, or enjoying a coffee at Starbucks. 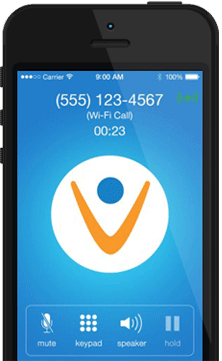 Subscribers can download the Vonage app from the Apple App Store and the Google Play Store. Vonage cleverly allows its users to integrate its service with a wide range of business software. This speeds up work flow and cuts down on the number of tasks needed to achieve the same outcome. Their cloud interface syncs the information in your business software with detailed inbound and outbound data. So, teams working with the cloud platform can enjoy screen pops for incoming and outgoing calls, click to dial service, call history and logging, note taking, integrated reporting, and continuity across cell phones (Apple and Android). Vonage also integrates with Bullhorn, Clio, Connectwise, Google Apps, Microsoft Dynamics, Office 365 and Salesforce. There are 44 standard, non-chargeable extras in a standard Vonage account, ranging from call blocking and call recording, to virtual receptionists, mobile apps and the Vonage service portal. It's an impressive feature set given the low starting cost of Vonage business VoIP, and extremely competitive given the rates of other providers that – in some cases – are almost double Vonage’s rate. There are some features that are not included in the standard business account. This makes the standard plan more affordable for smaller growing businesses, so that you only pay for the features you use. Thankfully, those features can be added at any time to your Vonage account. As your business grows, you can add premium features such as: call group, call monitoring, call queue, paging group, call recording: company-wide, call recording: on-demand, conference bridge, paperless fax, virtual mailbox, and Vonage Visual Voicemail®. New users can try the Nexmo platform for free and it's intended for all types of businesses - from growing startups to agile enterprises. There is 24/7 global support available and promises a 99.99% platform uptime. 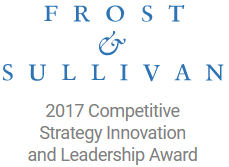 Vonage has won several awards for its business services, including multiple awards from Frost & Sullivan in recent year. This includes the 2017 Competitive Strategy Innovation and Leadership Award, as well as recognition for its MobileConnect App for Apple iOS 10. This is in addition to the award it won for its product line strategy and cloud communications in 2016. Vonage has also been recognised by the Temple University Fox School of Business and won a Stevie Award for customer service. The company boasts all-round savings of around 30% against traditional phone systems for users who subscribe to the Vonage business service, and the number sounds accurate. There are a wealth of features available, giving users a great deal of value for the money. Likewise, additional premium features and a la cart account customization make for a great deal of flexibility and scalability that should be attractive for small- to mid-size businesses looking to grow. If your business is getting ready to make the change to VoIP, Vonage offers an attractive starter solution that could easily grow with you. If VoIP is new to you, you’ll find Vonage set-up easy and straightforward, with some of the industry’s best support should you ever need it.